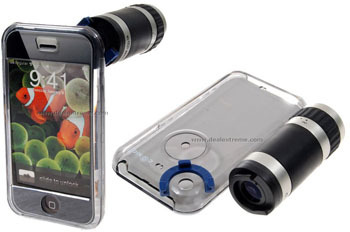 Today we’re presenting you with the optical zoom addon for the iPhone. The Conice 6×18 Zoom Attachment may look kinda ugly compared with the device it should be mounted to, but for $15 you can hardly find the more useful accessory for your shiny handset. As you can guess from the name of it, this baby adds 6x optical zoom, allowing you to comfortably spy on others from a safe distance. Not that we’re suggesting you should. It’s just an option. The folks over at Imaging Resource got their hands on Sony’s latest and greatest Cyber-shot, the DSC-N2, and seem to like what they see. The 10 megapixel camera is all about its prominent 3-inch touchscreen, and we suppose it’s one of those love it or hate it affairs, but the IR folks sure seem to fall into the former category. One of the niftiest features afforded by the touchscreen, which can be operated with your finger or an included stylus, is a “Spot AF” mode that allows you to point exactly where you’d like to focus, perfect for zeroing in on an off-center subject. They also found most other controls quite intuitive, though they’ve got some minor quibbles with the playback mode. Otherwise, the camera seems like a great performer, with a relatively strong flash, good low-light shots, and responsive performance. That fancy ISO 1,600 might come in handy, but you’ll want to stick at around ISO 200 or below to keep your images relatively noise-free. Other than a few other minor imaging qualms, the camera really looks like a great option for the consumer in search of many megapixels and some interesting functionality, and while the $450 pricetag doesn’t make it exactly a steal, it’s not too bad for what you’re getting.